The Firefox 5 Multi Fuel Stove has been engineered for cost-effective, high-efficiency performance and sleek design. Part of the world-renowned Firefox family, the Firefox 5 Stove is made from premium solid cast iron, marking it out for longevity, while the unique airwash control function offers a clear window onto the flickering flames. With an efficiency rating of 78%, 4.8kW output and easy-to-operate accessories, this Firefox Multi Fuel Stove will not only create an attractive feature but also majorly slash those energy bills! Self-supporting interlocking firebox component for ease of use and cleaning. Hi When burning wood with this multi-fuel stove, which is the most effective way? I understand as a multi-fuel stove there is a riddling grate which works well in increasing efficiency when burning coal and other solid fuels, but wood to prefers a single direction of air i.e not through the grate, from above only. I want the flexibility of a multi fuel stove, but would be mainly burning wood. Is the grate removable, or can you advice an affective method of burning wood with this stove? Any help regarding this matter would be gratefully appreciated. I have 2 stoves in my house and they have completely different characters, so it can be a case of trial and error learning how to get the best from them. I find the best way to burn wood in a multifuel stove is to start a kindling fire with the air control fully open. Once the fire is established, I add a log. When the log is fully alight, I add 2 more logs and then turn the primary air down to about a quarter. This gives the wood fire air from the back (Secondary burn) and top (tertiary burn) vents. If you find the glass starts to fog or blacken you need to open the air control more and if it's blazing through logs it needs turning down. Hi, Pricing up all the bits I need for a new Firefox 5 multifuel installation. It will be fitted onto a 6 inch liner, can this be swept through the appliance its self or must I fit a flue pipe with access panel? Yes, it is possible to sweep the flue through the stove so it's not necessary to order a flue pipe with a door. Good morning. I would like to purchase a Firefox 5 and just wanted to ask a naïve question. How do I work out what size of flue liner I need? Thank you for your question, it's a good question! Also add the thickness of the two floors. We use a figure of 0.5m per floor so in a standard two storey property this is an extra metre. The final figure is more than you will need but this is useful in case there are bends in the chimney. Flue liner is easy to cut but impossible to make longer. Hi there do you sell all the fittings from start to finish.like all the pipe work pots for the stack. whether you have an existing chimney or not. Please give our stove experts a call on 0845 450 8351 and they will help you design the perfect flue system for your stove. In which country is the Firefox 5 woodburning / multi stove built please? The Firefox 5 wood stove is made in China. Don't let that put you off though. It's one of our most popular models, we've sold hundreds without complaint and they come with a 10-year body warranty. We think the Firefox 5 is an excellent stove for the money. Yes, the Firefox 5 multifuel stove has a 10 year warranty covering body, door and moving parts. The glass, as with most stoves, is not a warranty item. 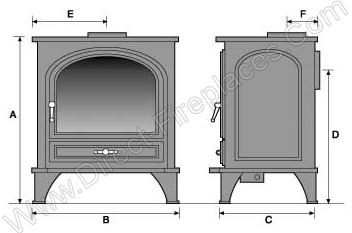 The fireplace chamber to accommodate a Firefox 5 stove should be at least 590mm wide and 500mm deep as the Firefox 5 needs a minimum of 100mm rear and sides clearance to effectively warm the air flowing around it. Whats the weight of this stove?